Do you need a dynamic speaker for your event? Do you need a high energy, high value speaker who delivers results-oriented, actionable content in an interactive format? Contact me to discuss your speaker needs. I deliver interactive presentations and workshops targetted specifically to business professionals, sales people and marketers. I appreciate how busy your event attendees are. That is why my training seminars have attendees complete as much work as possible during the training. That way, the training is more fully absorbed and the work doesn’t get put on the back-burner to other demands when the event is over. I am comfortable in front of audiences large and small. My presentations are customized to your length requirements. So whether you need someone to deliver an hour long seminar on a marketing topic, facilitate a round-table discussion or teach a one day workshop, I can meet your needs. As my background is in business development, sales, marketing and operations, I prefer to speak on topics within these areas. Below are my main speaking topics, however, I can customize topics and titles to meet your event needs. 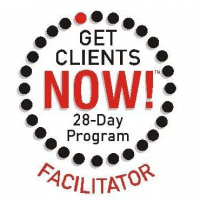 GET CLIENTS NOW!™ Participants learn how to create an endless stream of clients with this hands-on marketing training for business and sales professionals. Request a customized topic for your event. Ruth provided an excellent seminar for our sales team during out latest Sales Conference. Her presentation was informative and rich with practical tips and hands-on exercises for generating leads leveraging online tools. Valerio Mangano, Senior Marketing Manager, Atradius Trade Credit Insurance Inc.
Ruth presented to our exhibitors and conducted marketing audits of exhibitors’ booths upon request. She provided training that exhibitors could immediately apply in their booths at the Franchise Expo. Exhibitors who applied her techniques commented that they noticed a marked improvement in the conversations they were having with visitors and the quality of leads they generated. Ruth developed a presentation and resources for our pilot business program and facilitated the first workshop. The one-day workshop and course material were extremely well received and garnered positive feedback from all attendees. Ruth is efficient, effective, knowledgeable and professional, as well as being a dynamic facilitator. I would highly recommend her for facilitation and workshop development projects. We originally hired Ruth to speak on a sales panel at our annual event. After hearing Ruth speak, we engaged her to teach workshops on social media. We had consistently positive feedback from participants. She provided practical, actionable training in an interactive environment. Thank you for presenting a wonderful “Improving Your Website” seminar. I was going through the Customer Feedback forms and the program was rated as excellent and very informative.